This time of year, in the northern hemisphere, we’re not getting much sunlight. It’s cold, and going out means slogging through ice, snow, and slush. It’s easy to feel exhausted and isolated. It’s the opportune time to discuss a common foe against which many writers and artists struggle: depression. Sadly, there is no silver bullet to put this monster down, but there are things we can do to stop it in its tracks and even chase it back to the dark corner from whence it came. The first step, is arming ourselves and preparing for the next time it rears its ugly head. Here are my weapons. As I hope you already know, depression lies to us. It’s hard to be rational and calm during a bout of anxiety and even harder to find the strength to pull ourselves out of it once we’ve found ourselves mired in it. This is where preparation becomes very important. We have to build a bulwark against the attack before it comes. 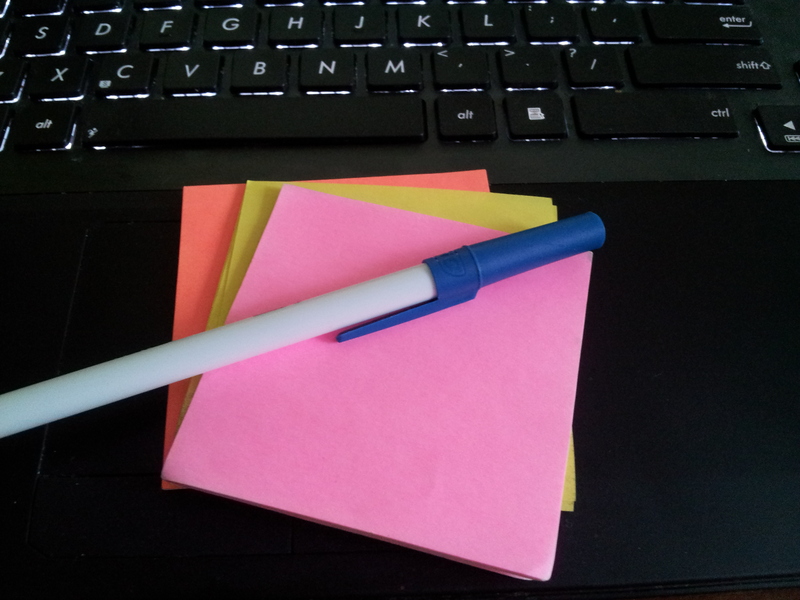 At first glance, I bet you’re thinking “Dayum, that guy’s got one hell of a to-do list!” However, those sticky notes are not reminders of anything I have to do. They’re reminders of things I’ve already done. 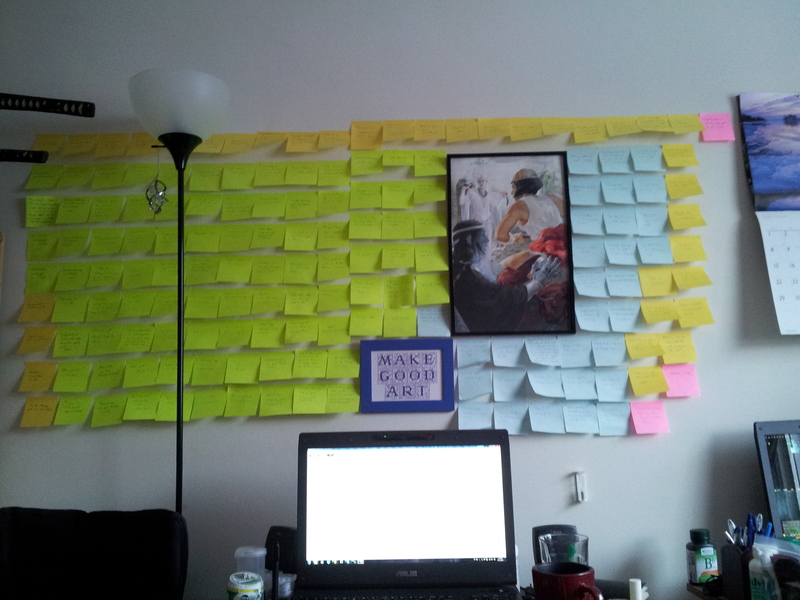 Each and every one of those sticky notes is a compliment I’ve received over the past year. There are more that I’ve forgotten to write down, but I’ve been as faithful in recording them as possible. As I’ve mentioned in a previous post, we all struggle with accepting compliments. Our instincts tell us to self-deprecate because we’ve been trained to think of humility as a virtue and pride as a vice. This needs to stop. It’s damaging. A big part of fighting depression is maintaining a clear perspective. It’s important to acknowledge when we have accomplished something, even something small, and take pride in it. Writing down a compliment forces me to acknowledge it. It might be something big like “Congrats on publishing your novel!” or something small like someone reblogging a post I made about making Halloween props. All compliments are important. They contribute to our general sense of self-worth. These acknowledgements that people give to us are the bricks out of which we build our wall against the ravages of depression. I am prepared. I can’t stop my brain if it’s determined to take a turn into dark places, but I can — even in the deepest of pits — raise my eyes a bare centimetre above my computer monitor and see the evidence of depression’s lies. Every one of those colourful pieces of paper is a shield, deflecting internalized messages of worthlessness, of being a burden, of being ugly and unlovable. So, at times when I cannot defend myself against depression’s lies, there are a host of voices right in front of me to shout it down and drown it out. No. I am not crap. I am not useless. Here are all the people who say otherwise! The best way to kill a lie is with the truth, and my wall is full of that. If you have need of a wall of your own, I encourage you to take this idea and use it. Nobody deserves to sit alone while depression and stress attack. You’re not crazy, you’re not weird, and you’re not hopeless. Depression is lying to you. Raise your shield and fight back. Previous Previous post: Blood of Midnight: The Broken Prophecy – Paperback Edition Available! Next Next post: A New Year!